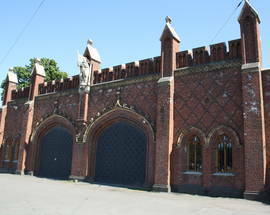 The Friedland Gate was built in 1857-1862 to the design of Ernst Ludwig von Aster and its completion marked the end of construction of the Second Defensive Ring. You may recognise the name of Friedland, today renamed Pravdinsk and found approximately 60km south-east of Kaliningrad, as the place where Napoleon routed the Russian Army in 1807 resulting in the Treaty of Tilsit, a point widely regarded as the high point of his conquests. 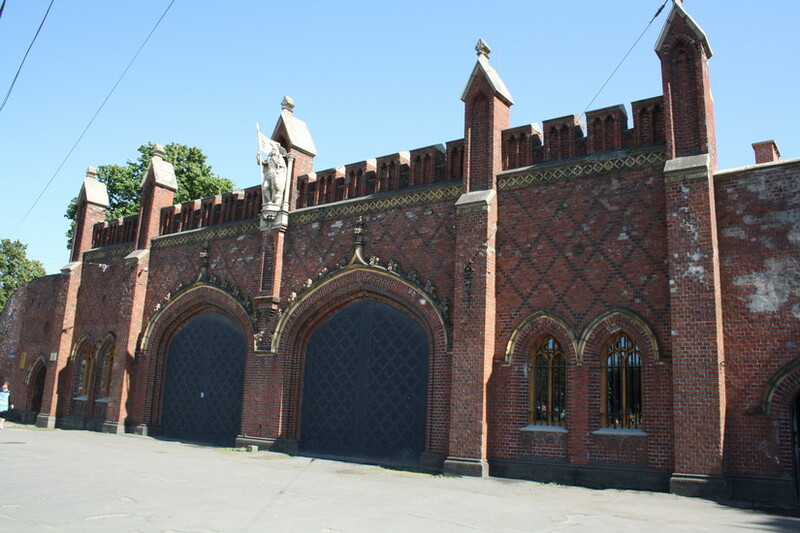 The gate can be accessed and inside you’ll find the Friedland Gate Museum which has a few exhibitions including one interesting one showing Königsberg life prior to World War II. The gate chooses to look further back in history for its decorative references and you’ll find a statue of Siegfried von Feuchtwangen, Grand Master of the Teutonic Knights from 1303 to his death in 1311, who moved the Teutonic Knights headquarters from Venice to their imposing headquarters at Marienburg (today Malbork in Poland) in 1308 on the outer facing wall of the gate. 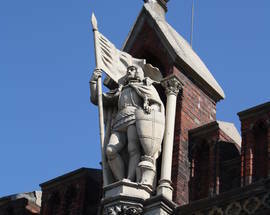 On the inward facing wall there is a statue of Grand Commander Friedrich von Zollern from Balga (today’s Castle Balga in the south-west of the Oblast). Both statues were damaged after WWII and were replaced in 2005 and 2008 respectively with sculptors using old photographs to recreate the detail. 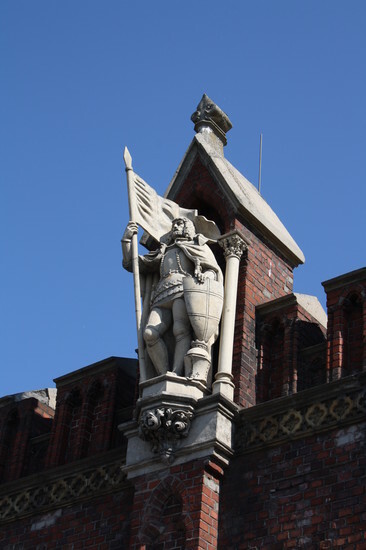 If you look at the statue of von Feuchtwangen you’ll see he’s holding the Middle Castle of Marienburg (Malbork) in his hands. 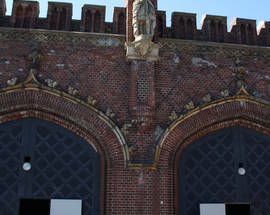 Being the last of the gates to be built meant that the Friedland Gate benefited from the experience the builders and architects about constructing fortifications they had learned on the earlier construction. In the early 20th century the gate was considered to be of little use and part of the adjacent defensive wall was demolished to allow a new road to be built and for the gate to be closed. It stood empty for many years following the war but now houses an interesting collection of Königsberg artefacts, many recovered during a clean-up operation of the nearby South Park lakes in the 1980s. 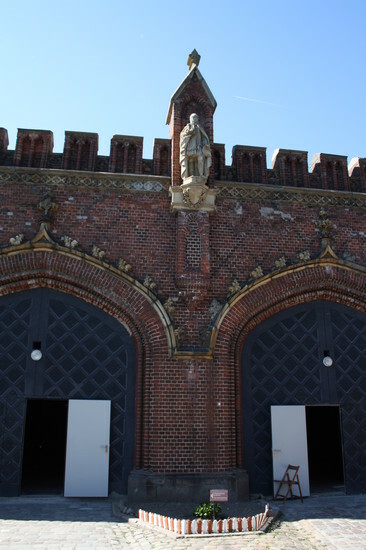 An original wooden gate with accompanying moat was built here, on the road from Königsberg to Brandenburg Castle, in 1657 but was upgraded to brick around a century later, the new structure housing a small defensive garrison and storage facilities.